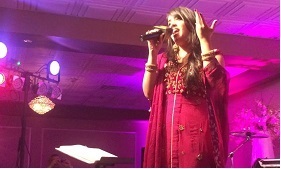 While the members of the band have been performing for several years, Sangeet Band was established in 2002. Through its stellar performances and adrenaline packed presence, the group quickly established itself as “The Most Energetic and Versatile Live Entertainment Groups in the USA, Canada, and the Islands.” Sangeet Band has members all over the USA, but considers “home” to be Florida. 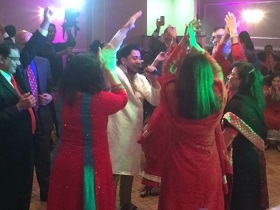 Sangeet Band does it all! Whether it’s an intimate Mehfil for a small group, to a rocking concert in a Convention Center; we’re exceptional at it all! Sangeet Band is also called upon frequently for Receptions, Walimas, Mehendi Nights, Sangeet Nights, Anniversaries, Raas/Garba/Dandia, Diwali Banquets, Fund Raisers, Lagna Geet, Baraat and lots more. The Band has had the opportunity to perform all over the world. Our performances have been featured in many countries including USA, Canada, Dubai/UAE, Jamaica, Curacao, Trinidad, France, Belgium, Netherlands, Portugal, Vienna, London/UK, Bahamas, Mexico, and Turkey. Sangeet Bands members are dedicated and professional musicians of the highest caliber specializing in Indian, Pakistani, Bengali Music. 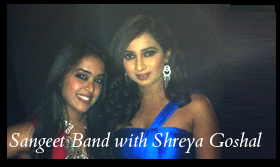 Sangeet Band has had the opportunity to work with numerous renowned artists of the highest grade. Some of the most notable artists include: Abhijeet Sawant, Alamgir, Ali Zafar, Amanat Ali Khan, Amit Paul, AR Rehman, Asha Bhosle, Atif Aslam, Daler Mehndi, Habib Wali Mohammad, Jagjit Singh, Kamal Taj, Kavita Krishnamurthy, Khursheed Seraji, Moin Akhtar, Munni Begum, Nizar Lalani, Nusrat Fateh Ali Khan Sahib, Sajaad Ali, Shafkat Amanat Ali Khan, Shankar Mahadevan, Shezad Roy, Shreya Goshal, Sudesh Bhosle, Udit Narayan, Umar Sharif and many more. We would like to thank you behalf of our Organization for an outstanding performance. My guests are still thanking you guys for waking them up after our long conferences :) We want to formally invite you next year for our annual conferences. Thank you again.”.